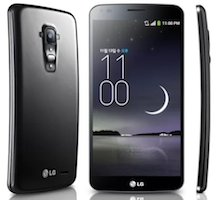 LG's G Flex phablet with curved display available online for a whopping Rs 69,490; is it worth a buy? Unveiled in Oct last year, LG Electronics' G Flex phablet- the first device from the company to sport a curved display- is now available for purchase online for Rs 69,490. While the company is yet to officially launch the device, it is available on a number of e-commerce stores as of now. While Snapdeal.com and eBay.in are selling the device for Rs 69,990, it's available slightly cheaper (Rs 69,490) on Infibeam.com. In addition, Mahesh Telecom, a Mumbai-based retailer is selling the device for as low as Rs 66,900. LG had earlier mentioned that the phablet would be available for purchase in the Indian market in Feb 2014, adding that the price will lie in the Rs 60,000 to Rs 65,000 range. Apart from being one of the first mobile phones to sport a curved display, the device also has new user experience (UX) features that take advantage of the curved form factor. Here is a quick look at the specifications of the phablet. Earlier, Samsung had taken the wraps of the world's first curved phablet, christened Galaxy Round. The device is in many ways similar to the Galaxy Note 3, except for its curved display and the exclusion of the S-Pen. To leverage the curved screen, the company has also added a number of features to the device, read here to know more. The company is yet to come out with an India pricing and launch date for the same. But looking at the price at which the G Flex is being launched, we feel it will not find many takers in India. It will remain a niche product and only people with deep pockets and an interest in curved displays will probably (if at all) opt for it.